Happy Motivational Monday AND Happy 100th episode!!!!! We are SO excited to celebrate this amazing milestone with you!!! It seems like just a few days ago we started The Blossoming Mommy and Baby Show and in reality it has been 8 months!! If you haven’t yet subscribed, do so NOW!! This way you will get automatic downloads to your iPhone (via your podcast app!) so you won’t miss a beat! In celebration of our 100th episode (I still can’t believe it! ), I wanted to share something SUPER fun. A healthy segment that many of our Mommas have requested! So, with the changing of seasons and prep week beginning for our Grounded + Glowing Clients, there is NO better time than right now to ensure your week and month is off to a FABULOUS and HEALTHY start!! Grab your hats, ladies! This episode is going to ROCK… ALMOST as much as these SKINNY Peanut Butter Cups from Instagram. 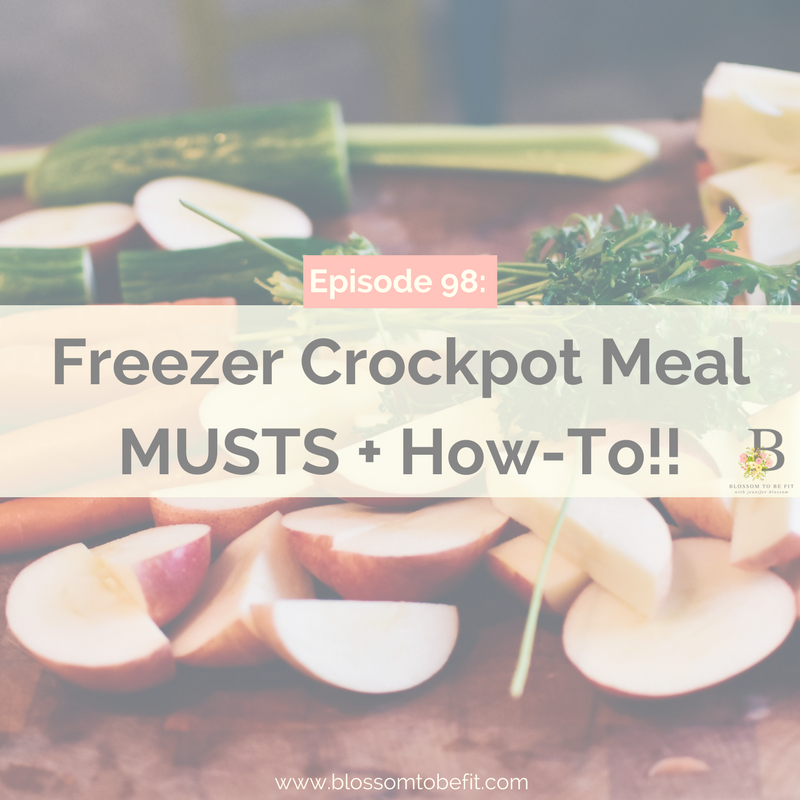 Okay girls, first things first… you have to know the dos’ and don’ts have freezer crockpot meals. First… the do’s! Do take your freezer meals stored in gallon bags out the night before to DEFROST. Do take time to plan out your meals in advance. Inside our Abundant Motherhood Club, I share monthly tips and tricks for ROCKING this aspect of your health. PS- one of our most popular membership teachings to date has been on all things MASTERING Meal Prep!! Do Label your bags!! Grab a sharpie and label EVERYTHING. Trust me, it will make your weeknights that much easier. Don’t compare your freezer crockpot meals to blogger professionals on the internet. Do what works for your family and if it tastes good and was EASY to make… you have got yourself a VICTORY! Don’t mix your veggies and meat. There are mixed reviews on this and it truly comes down to YOUR preference. For us, I marinate separately, unthaw separately and yes… cook in the crockpot together. The choice is yours, but I prefer your keep things on the safe side. Don’t leave your kitchen a mess. A happy kitchen is a CLEAN kitchen (or so… I always tell my husband!) You are done cooking up your favorite meals, make sure you wash your dishes and CLEAN up that kitchen! No one wants to walk into or wake up to a dirty, messy kitchen. (A few of my favorite cleaning products include:spray and homemade disinfectant wipes). Don’t get discouraged. I know it can be overwhelming to start a new (and healthy!) regimen. Like with anything in life…. remember to take baby steps. You are not going to have this skill down overnight, nor should you expect yourself to! Relax, celebrate your small victories, and just keep working at this craft until you become a MASTER! Your health and the health of your family will thank you! You can listen in to The Blossoming Mommy and Baby Show on your desktop HERE and on your podcast app (just download and subscribe to The Blossoming Mommy and Baby Show for automatic downloads each week!). Enjoy, Enjoy, Enjoyyyyyy girls! So excited for you to hear today’s lesson! If you loved it, don’t forget to subscribe on your podcast app and share with a friend!